Turning trash into treasure is the ultimate in recycling, and clever folks around the country are doing just that. 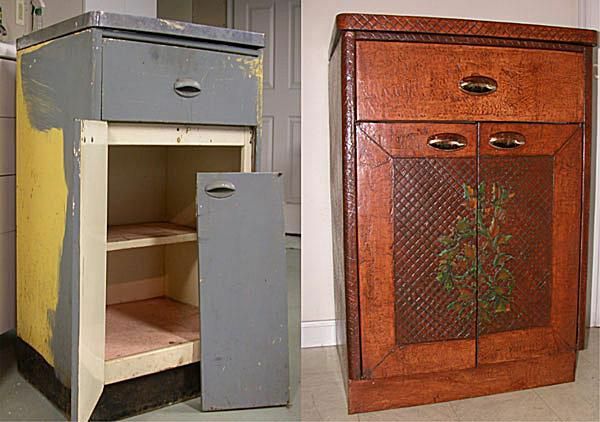 These makeover photos are proof that one man's trash is indeed another man's treasure! From Rose Wilde: "Just wanted to post this photo of my favorite trash to treasure project. I was sent this dilapidated old cabinet to refinish for a project where all proceeds would go to a Habitat for Humanity donation. Very satisfying project and fun to do." Nancy found this light fixture discarded on the sidewalk. She pulled out the electrical wiring, stripped, sanded, primed and painted it. With a little elbow grease, she was able to get the glass bowls looking good too. Now that it's reassembled and outfitted with tea lights, it can be used indoors or outside on the patio. For this elegant necklace, Dotty used an interesting 4" vintage mother-of-pearl belt buckle found in a little out-of-the-way antique shop as the centerpiece. She secured it to the beaded necklace with a little loop of pearls. Opalescent pink glass beads, imitation pearls, goldtone filigree metal beads and vintage Aurora Borealis glass beads completed her pretty design. Rose has a patent pending for the technique (Wood Icing) she used to refinish this lovely dresser. She purchased this piece in poor condition at a thrift store for $12.50 specifically to enter in a faux finishing contest in which the finished product took first prize. Rose named this impressive dressing table "Norma Jean." To learn more about her products, visit the Wood Icing website. Dinah found this broken Meerschaum pipe with a wonderful twin horse carving in an auction box lot. She decided to salvage it by attaching it to sterling sliver collar after adding 14 karat gold beads and crystal beads in amethyst, teal blue and green. What a great way to keep a lovely decorative piece out of the trash heap! Dotty says she loves using "found" items in jewelry design. For this necklace, she employed a 2" pierced metal sew-on trim piece with a black and silvertone deco design found in a batch of "junque" jewelry she purchased from an individual. Red and black vintage glass beads were recycled to echo the deco pattern of the centerpiece. A great way to save a piece of vintage scrap from the landfill! Bernadette's neighbors put this old washer on the curb for trash, luckily she saw it and moved it to her backyard. It has been a planter and an ice bucket, but now it is a fish pond. Love the paint job! Old silverware has now become silver "wear" ... Lindy says to ask grandma or mom for silver flatwear they are tired of polishing. She cut off the spoon/fork end with a hacksaw, drilled a hole in each end, attached jumprings, charms and a fastener, (after bending it around a pipe) and on the wrist it went! Lindy says everyone just loves this bracelet. Kimberly enjoys painting on things she picks up for a few dollars at second hand stores and thrift shops. This is a coffee table that was worse for wear until she sanded, primed and painted it, which resulted in a lovely accent piece. Sandy found this old window at a peddlers mall. She says the ideas she had for it were endless, but she decided to attach some old forks given to her by her mother-in-law, and add greenery and fruit to decorate it. Sandy says, "I'm so happy with the way it turned out!" Being a lover of "junk" makeovers, Eve decided to take an ordinary baseball and paint it with patio paint available at any craft store. Afterward, she sprayed it with a couple of coats of clear finish and glued on some pieces of broken jewelry for the antenna. She thinks it looks cute tucked under a plant outside in the yard. So do we! Submitted by: Shannon Cauble, Texas. This was an old chair that was given to Shannon. She based coated it white and added detail to it using acrylic craft paints for her daughter's bright, garden themed room. She loves the way it turned out! This is another one of Rose's resale shop finds she purchased for $45. Someone had attempted to refinish it but ruined it in the process. She replaced the knobs with wonderful Rose designed handles as shown in the inset photo detailing the finish. She achieved this attractive "Cracklin Rose" design using her Wood Icing product. Kathleen pulled this horrible looking rocking chair (top photos) out of a dumpster. Everyone thought she was crazy, but she definitely saw potential. Five months later, after stripping it down and convincing her husband to help her sand a bit, she brought the wonderful tiger maple wood back to life and she reupholstered the chair (bottom photos). It turned out beautifully. As a bonus, there was a date of 4-17-1916 chalked onto the inside of the side rail of the chair. Kathleen couldn't be more happy with her dumpster find! Diane's friends often give her their castoffs because they know she likes to turn trash into treasures. Diane took this old stero speaker, removed the "guts" and added some old legs off of another "trash" item. Then she covered the sides with an attractive wallpaper border, covered the top with a 99 cent wooden tray painted to match and a put a flower pot in the speaker hole. Can you say unique? Here's something else Melody made from scraps. She took an old mirror that someone had given her and cut it up into strips. She layered them with heavy duty two-way adesive tape like they use to hang things on walls. Displaying it on a plate holder was a great idea too! Here Melody salvaged an old trumpet and turned it upside down to use as a wall vase. She notes that everyone loves this idea since any old horn will do! Maggie bought bought this potato bin at a local thrift shop for $14. It was rather ordinary looking so she crackle painted it with a gray base and white topcoat and decoupaged a pretty poster to the front. It turned out just the way she had envisioned it! This tin wall pocket was made by Lindy's husband after she gave him a few instructions. Instead of wiring the two pieces of tin together, he riveted them. This has been on Lindy's wall for a year and she likes it so much she's having a hard time thinking about taking it down for Christmas. Here, antiques windows Melody found in her old homestead barn, thick dowel rods and a glass top were used to make a very functional bar for her home. What a great idea! Using an old door she took out of her barn, Melody painted it three colors: green, teal and white. She sanded it down and then installed a mirror and put blue tiles around the edge. She says that everyone loves the way this door looks in her home. Melody also took an antique horn, which belonged to her husband as a boy, and made a vase to hang on her crafty creation. Melody used an antique headboard and mirror on top of a cabinet made of old windows to make a display for her shop. She painted it white and sanded down all the edges to give it a shabby chic look. How lovely! This attractive patriotic piece started with a chair Melody actually pulled out of the dump. She painted it red, added some vibrant fabric and definitely turned another man's trash into some very special treasure. Melody made this pretty mirror using seashells she collected over the years. She glued each one individually to plywood and then applied a coat of lacquer to hold them in place. She then added a mirror to the back secured with mirror hooks. Easy, fun and charming! Melody also uses old windows to make tables. Adding a simple skirt around the edge of the window, some fancy legs to hold it up and a coat of paint makes a lovely occasional piece. This footstool was purchased at an estate sale for 50 cents. I invested in enough frabric to cover the extremely worn upholstery using a heavy duty stapler to tack it in place. I also removed the very worn wooden legs and painted them black. I loved the way this piece turned out, and the way it looks in my bedroom. Purchased for around $25 at an auction, this fold down desk/chest combination was refurbished with a wide self-adhesive wallpaper border surrounded by antiqued white wooden trim. The inside of the desk cubby and drawers are lined with a blue and white pinstripe wallpaper "for a neat look." Another inexpensive auction buy, this 1940s chest of drawers features a Gibson Girl style print decoupaged in the wooden medallion area. A set of crystal drawer pulls replaced a metal set, which was missing two pulls. A thick piece of glass tops the piece to make it functional. This chair was purchased at an auction in rather bad condition with a deep black stain and a few bangs and nicks. Kay applied a sealer and a couple of coats of a semi-gloss blue and then added her hand painted designs. She says the child that now owns it won't sit in another chair! Again, this was something a friend of Diane's was throwing out in the trash, an old wooden chest of drawers. The drawers were missing, but the solid wood frame was still good. She took the top drawer divider out and made the space below into shelves. Inexpensive screen doors were added to the front along with a little hand painting . A great look for very little money! Kay purchased this old school chair, along with a few others, at a yard sale. She spray painted the background and free hand painted the colorful designs for a charming result. For this easy project, Diane used 2' X 2' tin ceiling tiles that she picked up at a flea market for $10. After cleaning them up she painted and framed them. She says, "Paint is the magic" that made these so attractive. Some silver ceiling tin tiles were given to Lindy for Christmas by a contractor that knew she loved junk. She didn't have enough tiles to line a ceiling, so she's been using them for projects instead. This piece was made with an old barn window, tin tile and the lumber from an old screen door. Lindy uses this attractive planter outside in the summer and inside in the winter. Brenda's cleverness in transforming discards to useable furnishings abounds. From adorning shelves with rusty garden tools to sprucing up average wall hooks with sparkling chandelier prisms to this great hall bench made from an old door. Good work! Joanne found a number of display toppers at the dump and couldn't pass them by. She set four of the pieces together to make a square and used one for the roof to form these great decorative garden houses. The "cap" on top made a great chimney. Each 4-foot high house is decorated in a different theme, with gems on the curtains of one house and a diamond shaped mirror on the door. The pink one even has a clothesline with little clothes pinned on the line. Very cute! This bed once belonged to the aunt of the new owner's husband. The railings were lost over the years, but she loved it the workmanship so much she felt it was well worth transforming the piece into a new family heirloom. Brenda and Laraine have a pastime the like to call "curbing." That is, they hit the streets looking for things that have been kicked to the curb that they can make over. In fact, the dynamic duo completely redid Laraine's basement with their curbing finds. Kudos to these clever ladies! Sally owns Old Town Amherst Antiques & Folk Art, and judging by her makeover photos it must be a wonderful shop. The photo on the left shows decorative hot pads and coasters she hooked using rug scraps and an old coat of her mother's. The shelf was made using old shutters from a cottage in Maine strapped together with metal strips and painted crackle green before adding mirror accents. The entire project cost Sally less than $35 and it looks wonderful.